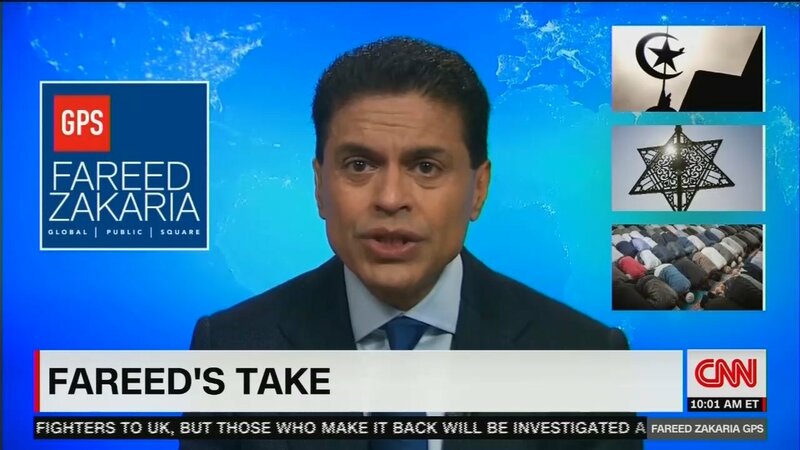 On Sunday's Fareed Zakaria GPS, host Zakaria devoted his "Fareed's Take" opening commentary to the recent controversy over Michigan Democratic Congresswoman Ilhan Omar complaining about Jews donating money to political candidates to gain support for Israel. The CNN host admitted there is much anti-Semitism in the Middle East, but blamed Europe for fomenting the sentiment as he also worried that Omar's comments will make it more difficult to criticize Israel in the future. Zakaria began by recalling that two recently elected Democratic members of Congress have made comments that have led to charges that "there is a rising tide of anti-Semitism on the new left." He then recommended that Muslims "should be particularly thoughtful when speaking about these issues because anti-Semitism has spread throughout the Islamic world like a cancer." After informing viewers of recent studies finding high levels of anti-Semitism in the Muslim world, he then recalled that there was a time when there was not so much anti-Semitism in the Middle East and placed blame on Europeans for showing favoritism toward Jews since the 19th century, leading Muslims to start "importing European anti-Semitic tropes like the notion of blood libel." He soon added: "What supercharged all of these attitudes was the founding of Israel in 1948 and the determination of Arab leaders to defeat it."